The new iPod touch with an A8 processor and upgraded 8-megapixel rear camera just launched this morning, but TechCrunch's Matthew Panzarino already has one in hand and has run some benchmarks on the device. 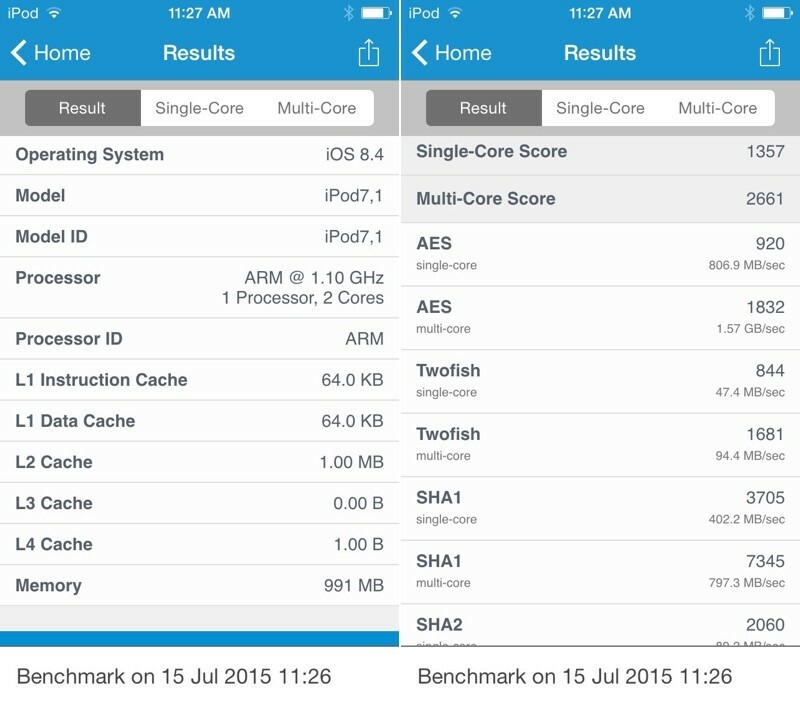 According to early testing, the A8 processor in the new iPod touch appears to be running at 1.10GHz per core, which is slower than the 1.39GHz per core the iPhone 6 runs at, presumably to manage battery life. 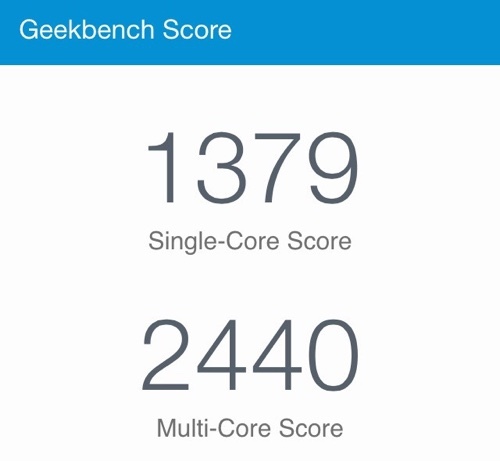 In Geekbench 3, the iPod touch scored 1379 on the single-core test and 2440 on the multi-core test right out of the box. The previous-generation A5 iPod touch scored 215/410 on Geekbench's single and multi-core tests, so the new sixth-generation iPod is six times faster and a massive improvement over the fifth-generation iPod. Labeled as iPod7,1 instead of iPod6,1 as expected (the previous-generation iPod's model ID was iPod5,1), the new iPod touch ships with Apple's latest operating system, iOS 8.4, so it works with Apple Music out of the box. Like the iPhone 6 and 6 Plus, the iPod touch has 1GB of RAM to go along with its A8 processor. The new iPod also includes an M8 motion coprocessor for recording motion activity that's uploaded to the Health app, and it supports 802.11ac wireless. Its 64-bit A8 processor is a major improvement over the A5 processor in the older iPod touch, and it includes support for Metal, bringing much-improved games to the device. The iPod touch has one feature that hasn't yet made it into other Apple products -- Bluetooth 4.1. It's the first of Apple's devices to offer the new specification. Bluetooth 4.1 is more reliable, offering less interference with LTE bands, improved power management, and better data transfer. Available in several new colors, the iPod touch is priced at $199 for the 16GB model, $249 for the 32GB model, $299 for the 64GB model, and $399 for the 128GB model. It's available from the Apple online store beginning today. Apple's also released new iPod nano and shuffle models in updated colors, but the internal components of those devices have not changed. I think that a $749 iPhone in 2015 should come with 32 GB standard. 64GB iPhone 6 is $749... So you are saying you want LESS storage? I like that you can go from 16GB to 32GB for $50 if you want it! (I prefer that price point than forcing you to 64GB for $100 more). Why no Touch ID ? Why?? Clocked lower than the iPhone 6... pretty much what you'd expect. Still, for an iPod at that price point it isn't bad at all. Planned obsolescence. Apple should be taken to court for that, it's unethical fraud and spitting in the face of Apple consumers. Seriously? Get over it. Show me a 3 year old android phone that runs as good as ANY 3 year old iOS device. Same goes for computers average Mac is kept about 5 years compared to Windows machines that are like sloths after 5 years. People are still rocking iPhone 4S and 5, iPad 2,3,4 and 2010 Macbook. Gut check pal, get your facts straight. You missed they also don't have an anti-gravity module for it to feather-fall to the floor when your drop it. They still don't have user adjustable case color and you have to order a color at time of purchase. Worst, no free standing holographic display to really get the full features of the Disney Star Wars app. Also, your pony don't show up for your birthday again.